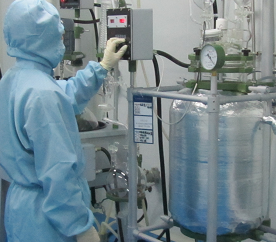 JenKem Technology provides high quality activated multi-arm heterobifunctional PEGs with high purity and low polydispersity. JenKem Technology’s patented multi-arm heterofunctional PEG Derivatives are designed as linkers for Antibody-Drug Conjugates or ADCs, as they facilitate the coupling of high ratios of drug molecules per antibody. ADCs conjugated via multiarm PEGs deliver a higher concentration of drug to target for each antibody-antigen interaction, and exhibit improved solubility and PK/PD profile. Multi-arm heterobifunctional PEG Derivatives are also ideal for connecting two different drugs at the same time, thus offering dual synergistic function and increased drug loading. JenKem Technology provides various multi-arm heterobifunctional polyethylene glycol derivatives with different branching and functionalities. JenKem Technology reports the total molecular weight of multi-arm PEG raw materials as the sum of the molecular weights of all the arms. The number of ethylene oxide units in the PEG chain may not be equal for all arms. 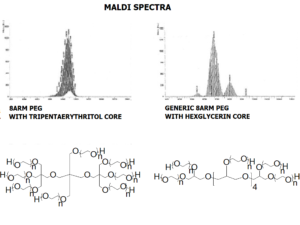 8ARM(TP)-PEGs with tripentaerythritol core have a higher purity as evidenced by MALDI compared with the generic 8ARM-PEGs with a hexaglycerin core. Multi-arm Heterofunctional PEG products with molecular weights and functional groups not listed in our online catalog may be available by custom synthesis. Please inquire at tech@jenkemusa.com about pricing and availability of custom PEGs. Coppock, M.B., et al., A Universal Method for the Functionalization of Dyed Magnetic Microspheres with Peptides, Methods, 2019. Coppock, M.B., et al., A novel discovery, maturation, and assay integration approach for the development of ruggedized multi-valent capture receptors exemplified against the chikungunya virus E2 protein, Sensing and Bio-Sensing Research, 2019, 22. Liu, K.F., et al., A novel self-assembled pH-sensitive targeted nanoparticle platform based on antibody–4arm-polyethylene glycol–pterostilbene conjugates for co-delivery of anticancer drugs, Journal of Materials Chemistry B., 2018. Dai, L., et al., Novel Multiarm Polyethylene glycol-Dihydroartemisinin Conjugates Enhancing Therapeutic Efficacy in Non-Small-Cell Lung Cancer, Scientific Reports, 2014, 4, 5871.